So... What About a Sequel? The plan is to go print-on-demand as soon as possible. First, through Lulu, so my Canadian pals can get copies without paying ridiculous shipping. Then, through RPGNow. I'm trying to get that process underway this weekend. For a time, I will be giving those who buy a hardcover at Lulu a free PDF. I only have so many free PDFs I can give out. Fortunately, I'm pretty stingy with them. So there's a good number of them. Conversely, I will try to give a decent discount for hardcover copies to those who buy the PDF. I'm still working out the details but it should be pretty comparable to the other route as well. After I get the book up at RPGNow, there will be a print+PDF bundle. Until then, I'll have to do it the hard way. But the hope is that everyone who buys a hardcover gets a PDF free. And, for a limited time, everyone who buys a PDF while the print-on-demand is getting going will get a good discount on a hardcover through Lulu. What happened to the Grimoire? About a year ago, it became clear that I would have to split the books up into 3 books -- Transylvanian Adventures, The Hanging Judge's Guide to Transylvania, and The Transylvanian Grimoire. Transylvanian Adventures includes 8 character classes for DCC RPG, a sample 0-Level funnel, a large number of tables for lots of Hammer-themed fun, a bevy of rule enhancements, and -- well -- general awesomeness. It's 300 pages and it ain't in 34 pt font. There's a whole lot in there. It has one spellcasting class, three rituals, and some guidance on what spells in DCC RPG might work well with Transylvanian Adventures. I'll just say this: I've been playing TATG for years now with nothing but the DCC RPG spells and the bare bones of what will become the Grimoire and I've had a fine time. The Grimoire will be great. But there's a lot of fun to be had with Transylvanian Adventures. The Hanging Judge's Guide to Transylvania is the next release on the schedule. It will happen sometime next year. The reason it's #2 is because it was mostly written but soon became apparent that Transylvanian Adventures would be way too big a book (and it would take too long to finish properly) if all that content was included. So instead of waiting a whole 'nuther year to release a nearly 600 page book, I opted to release a working and complete Transylvanian Adventures without the items that will be featured in the Judge's Guide. Included in the Judge's Guide is a full hexmap of Transylvania, a few of the more radical rules hacks that were excised from Transylvanian Adventures, factions, adversaries, monsters, and a crazy amount of setting info on Transylvania. This will be a healthy-sized book but it will likely be the smallest of the three. Still easily past the 200 page mark. The Transylvanian Grimoire is the magic book. It will feature the Theorist class, spells, rituals, potions, patrons, and setting hacks. I'm also writing up monster character classes in the Grimoire. It's the last book because it's the least written. I'll be able to give a better timetable on it when the Judge's Guide is done. I think it should be apparent that, if the first book does well, the other two will come out sooner. If it doesn't do so well, the other two books are more likely at risk. Once the print-on-demand is good. 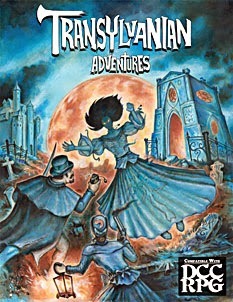 I'll be working on an artless, cheapo copy of Transylvanian Adventures. It will most likely be free and will be a nod to those who are either too cheap to buy a copy or on-the-fence in making a decision. It will have a subset of the classes in Transylvanian Adventures but will feature the full set of Rules Enhancements. It will not have all of the tables in Transylvanian Adventures. If you want the Mad-Libs, you'll have to buy the real thing. Same with all the adventuring tables and Investigation tables. The cheapo version will have 4-5 classes and the rule enhancements and that's about it. It will only be available as PDF. As I complete some sections, I'll make portions of The Transylvanian Grimoire available for purchase. These will be things like the Mercurial Magic tables. Patrons. Maybe a setting hack or two. Enough stuff to give people who want to play TATG long-term a boost. At some point, I'm hoping to revisit The Winter Home and make it available for print-on-demand. That's low on the list. But could bump up higher if a strong demand is there. Tales from the Tomb: Humble Beginnings? It's hard to believe but I started working on Transylvanian Adventures back in 2007. The impetus was a series of threads on a number of role-playing game sites debating the value of a Hammer Horror style of game. It was the conversations in these threads that steeled my resolve to undertake what I'd hoped would be the definitive Hammer Horror RPG. Back in the early days, the biggest thing with which I struggled was finding a system to use as a base for Transylvanian Adventures. I vacillated between Barbarians of Lemuria and Swords and Wizardry, while devouring hours and hours of much-beloved Hammer films and reading page-after-page of Gothic horror. It was a time-warp back to my youth, when a Slurpee and the latest Tomb of Dracula was all I needed to dull the doldrums. In all honesty, it was probably my favorite slice of the early days of Transylvanian Adventures. As time went on, I began collecting research on Romania and Transylvania, even briefly interviewing people who had lived in Transylvania and grown up in the region. All the while, I was testing out my ideas on the system and systemic changes that would be needed to create a game I would be proud to add to my own collection. It was around this time I decided the game needed levels. Levels, tried and true, encouraged repeated play. And I found the familiar mechanics of saving throws, hit points, and armor class to be just fine -- even preferable. Shortly thereafter, Joseph Goodman announced his intention to publish Dungeon Crawl Classics and his approach resonated with me. What he was attempting to accomplish with DCC RPG and Appendix N was exactly what I wanted to do with Hammer Horror and Transylvanian Adventures. Since then, Joseph, the Goodman Games team, and the community over at the Goodman Games forum have been incredibly supportive of the project. They have validated over and over my decision to marry this labor of love to DCC RPG. Thank you all. And especially Joseph for providing the template and the system upon which Transylvanian Adventures is built. I also need to thank two more people besides Joseph Goodman. The first is Daniel Bishop who signed on to help with the project in any way possible way back before anyone had heard of it. Daniel was the very first artist to work on Transylvanian Adventures. Second, I have to recognize the contributions of Doug Kovacs. Getting the opportunity to work with Doug was one of the greatest privileges I've experienced in my time creating Transylvanian Adventures. Doug came in at a time when the project was stuck in neutral. Without Doug, this book would not be here. He showed Transylvanian Adventures the way home. Which brings us nicely to the next topic. Transylvanian Adventures is available now for PDF download. It's 300 pages and is on sale for $12.99. And here is a look at Doug's outstanding cover art. One of my favorite pieces. The final draft of Transylvanian Adventures has entered into the approval process. Once Goodman Games and RPGNow give it the okay, it will be available for PDF download. Following that, work will begin on offering a print-on-demand version. The final PDF comes in right around 300 pages. Price for the PDF is still in question. I have a better handle on how much the POD version will cost. For a limited time, I'll be able to offer a free PDF to those who buy a hardcover POD version. I'll try to offer coupons for those who pick up the PDF early, so that they get a decent discount on the POD version. I'll have more details soon, including a post where I feature the amazing cover art by Doug Kovacs.